As if having the giant Christmas tree in the living room wasn't enough, we are now the proud owners of a lovely rosemary kitchen Christmas tree! Our neighbor is a retired florist who seems to be very excited to have someone appreciate her skills as much as I do. She has made us feel completely welcomed in to the neighborhood. Definitely a "borrow a cup of sugar" kind of neighbor. It pretty much fills the entire front door. I absolutely love it. 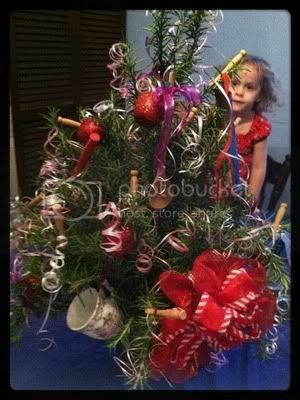 Then, she brought over the most amazing Rosemary plant covered in ornaments! She called it a kitchen tree. And, she told me how to do it, and I will now share with you all how to make one :) I'm sure there are some of you that already know about this, but it was news to me! Fashion a large bow out of the wide ribbon. Attach it to the rosemary with craft wire. Arrange the larger ornaments on the tree first, attaching them all with craft wire. Be sure to add lots of pops of color. Next, cut lots of curling ribbon (the kind used to wrap presents) and run it along the edge of a pair of scissors to make it curl up. Strategically (or haphazardly, if you're like me and non crafty) arrange the curled ribbon on the tree. That's it! The tree does need watering every day, maybe about a half cup of water. The great part of this living Christmas decoration is your house smells AMAZING. Right now you walk into the living room and smell the tree, then walk into the dining room and smell the rosemary. Heavenly! And, you can use the rosemary, too, for cooking. It's one of our favorite herbs to cook with. what a great neighbor!!! 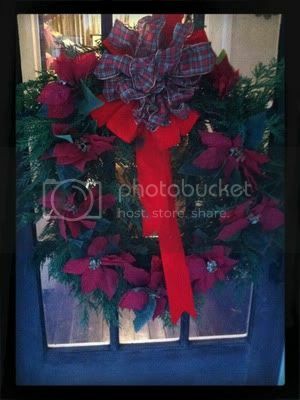 Love the wreath on the door.